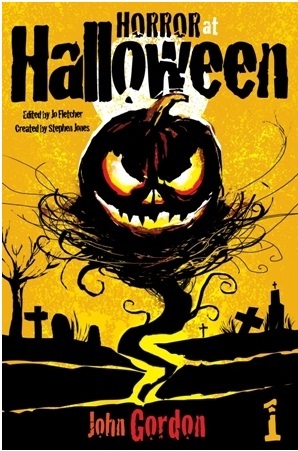 Review of Horror at Halloween Part 1 by John Gordon | What YA Reading? In his new hometown, British teenager Sam Jones discovers that a legendary backwoods bogeyman has risen from the grave to seek revenge against those who put him there . . .
What better way to celebrate Halloween than reading a chilling YA mystery that gives you goosebumps? And for free… how could you resist? After moving from England to the American town of Oxrun Station, Sam starts hearing whispers. And not the kind of whispers that come from a prankster friend… I’m talking about the kind that you hear inside your head. Sam quickly gets caught up in Oxrun’s ghost story and discovers it has a strange connection to the whispering he hears. With the help of an unlikely person linked to Sam by the same insanity, he finally unravels the creepy mystery of Oxrun Station. And the mystery was creepy, all right. However, I do have some issues with the other parts of the book. First of all, the pacing was really lacking. The first bit of this book was very, very boring. The kind of why-am-I-even-reading-this-I-have-better-things-to-do boring. At the half-way point, it got better. Things picked up and I found myself drawn into Sam’s drama. Three quarters of the way through, Oxrun’s mystery completely developed, and my heart started beating faster. Finally. I thought I must have offended her. “I’m sorry,” I said. We were both laughing as the car, having crossed the pass, began to slide downhill into Oxrun. I also have a serious problem with the characters’ lack of profundity. Penny is pretty, so Sam falls head over heels in love with her. It doesn’t matter that she’s petty, disloyal, or mean. She’s pretty. That’s all. To make matters worse, at least half of this book seems to be centered only on Sam and Penny being together, with absolutely no development of the plot. Luckily for him, Sam redeems himself. Otherwise, he would probably be mauled. Verbally. It would most likely be fatal. Glyn is my favourite character of Horror at Halloween Part 1. She’s mysterious, literate and strong-willed in a a shy sort of way, albeit an outcast. I admire her for supporting her barely existent family and risking her life to protect them. Although the friendship she and Sam share is an improbable one, I very much enjoyed it. When Horror at Halloween Part 1‘s mystery completely presented itself, it morphed into a good read. Reading it, my heart rate picked up, and I became utterly enraptured. It was spooky, action-packed, and fast-pasted, and I enjoyed it. This book would have merited at least 3.5/5 stars had the plot been more centered on the mystery itself. However, it only deserves 2/5 stars. It was a great ghost story to read for Halloween, and it would be a great ghost story to read anytime of the year. I just wish there was more ghost story and less… everything else.